With the heat of summer long gone and autumn yet to start with a vengeance, you’d be forgiven for thinking there isn’t a lot of point getting out on a garden visit. Wrong!! So many gardens now extend their season of interest with ornamental grasses and late flowering perennials, that there’s still a lot to see if you know where to look. 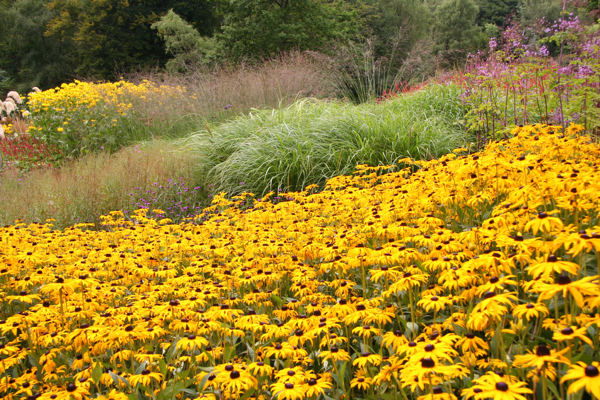 Late summer colour with bold groups of grasses and Rudbeckia. Whilst many gardens simply have plants which offer late interest added in to their overall schemes, there are a number which specialise in late flowerers and are really at their best at this time of year, so there’s plenty to enjoy. 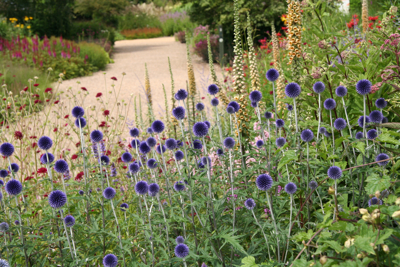 There’s just time to visit Sussex Prairie Garden which is open until 12th October this year. It’s a fairly new garden in West Sussex where you can see large borders packed with perennials and grasses in bold swathes – a naturalistic planting style that’s become known as ‘Prairie planting’. Or if you prefer something a bit more traditional, try Great Comp near Sevenoaks in Kent (open until the end of October). It’s a garden set in the grounds of a 17th century house, where you’ll see Dahlias and Salvias flowering their socks off. You can also visit Dyson’s Nurseries which is on-site and specialises in late-flowering Salvias, many of which are unusual and not commonly available. Asters (Michaelmas Daisies) are brilliant plants for late summer and autumn, and near Malvern in Worcestershire you can visit the Picton Garden to enjoy a huge collection of Autumn flowering Asters. The garden and Old Court Nurseries are open until 20th October. A long time ago I visited Scampston Walled Garden at Scampston Hall in North Yorkshire and loved it. The planting here was carried out by Dutch plantsman Piet Oudolf (who seems to be planting gardens all over the UK, if not the world, these days!). This year the garden is open until 2nd November and I really recommend it (and the restaurant’s good too!). Of course if grasses are your thing, you really should take a trip to Knoll Gardens near Wimborne in Dorset. 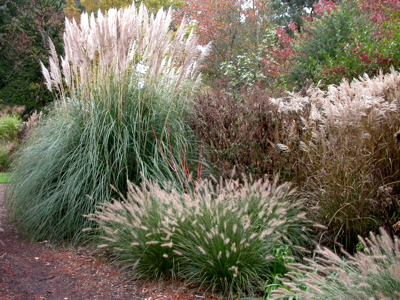 This nursery has become probably THE go-to place for ornamental grasses in the UK, and their stands regularly win gold medals at the Chelsea and Hampton Court flower shows. The garden has been designed to showcase grasses which growing in different situations – with a wide selection of flowering perennial plants which complement them – and it’s open pretty much all year round (other than January). There’s also a very tempting nursery just by the car park, and I defy you to leave without buying at least one plant. Or maybe that’s just me?